So how'd I do? Better than the Bulls, though not so great with that prediction, either, since I had the Bulls ninth in the Eastern Conference with 35 wins. As the comedian Don Adams used to say, "Missed by that much." Did you, by the way, hear about the injuries? The preseason Las Vegas over/under for the Bulls was 27.5 wins. I figured the over was a sure win, which is generally why I play golf and go to the movies when I'm in Las Vegas. Yes, stuff happens. But how the heck did they know? Though they did have the Lakers at 48.5 wins. I did, also, but did you hear about the injury? My belief was the Bulls were good enough to be in contention late in the season, sort of like Miami and Charlotte. Not good enough to make the playoffs, but taking a step and good enough for some meaningful games. Of course, if they were, things likely would be much different now with Fred Hoiberg probably still the coach, Bobby Portis looking for a Bulls contract extension and Jabari Parker perhaps the Sixth Man winner I had him to be. Jabari made sense as a potential Sixth Man winner, and he did have a good enough season offensively when he was in the rotation, though in different uniforms eventually. Which changed everything. I guess I went a little home cooking picking Zach LaVine for Most Improved. He's basically been ignored in that category because of the Bulls season. But he should be a candidate by improving seven points per game this season to the top 20 in the league in scoring after ACL surgery. He's the most athletic player ever following the surgery. It is an amazing story which would have been more celebrated if the Bulls weren't 22-60. I didn't do badly on Rookie of the Year with Luka Doncic winning and Trae Young third. I had Mike Budenholzer second for Coach of the Year (he'll probably win) and Quin Snyder first. I made the out-on-a-limb choice of Golden State to win the West. I had the Jazz second and Rockets fourth. Ooops, I had the LeBrons third. I was a believer. I had Boston to win the East, Philadelphia second and Milwaukee fourth. I had Orlando 15th in the East. I guess I overreacted after picking them to make the playoffs last season. Missed by that much! The Bulls healthy could have had this Magic season, it would seem. Which also suggests making that leap to the East playoffs is not actually a leap. You do know D.J. Augustin is their point guard? Mo Bamba became, who? Yes, coaching does matter, as it turns out. Steve Clifford discovered what Frank Vogel never noticed, that Nikola Vucevic could score if you had any plays for him. He's doing it with Jerian Grant and Michael Carter-Williams. Maybe he should be Coach of the Year. Of course, Boston hasn't lost the East yet. Though it doesn't look that promising. But the way the first playoff weekend has gone it doesn't appear as if anyone can win the Eastern Conference. The Bucks? Really? Should we start next season and just let the Warriors have a parade this week? 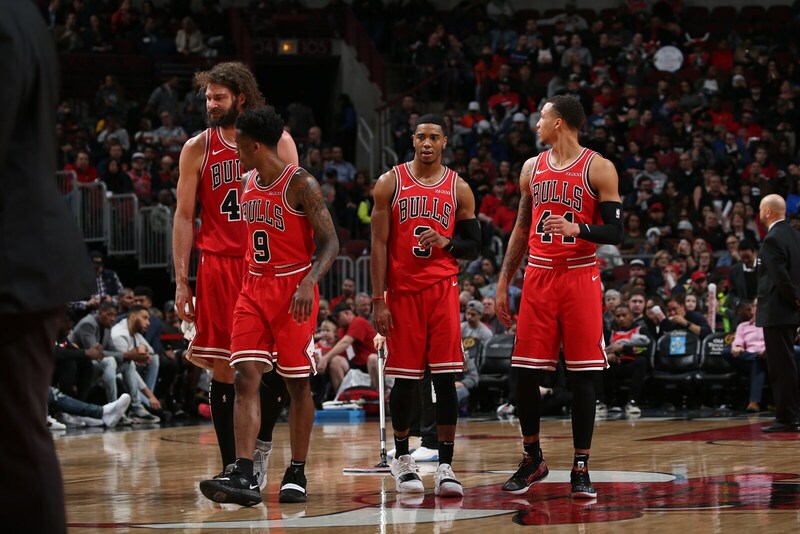 And about next season, here's an early look at the season that was for the Bulls and who may and may not be around to complete the roster and compete. He reached the edge of NBA stardom, but he's going to have to play more games unless some team is begging him to resign and let's him sit out like Kawhi Leonard did in Toronto. LaVine sat out the last 10 games with knee soreness after sitting out the last 14 last year. Perhaps it was not to risk anything with the team lottery bound, but a player also can get in the habit of not playing. That's a concern for the Bulls. Otherwise, LaVine proved to be a terrific competitor. He shouldered the burden of carrying the team when four of the main seven were out and was the primary finisher and big game scorer with three games scoring more than 40. He needs to attempt more threes because he's an excellent distance shooter. Along with Lauri Markkanen, he's the best candidate for the 2020 Chicago All-Star game if the team improves. He had a great month. He needs to have three or four more next season. He missed the first two months with a freak elbow injury and then had some heart issues that ended his season prematurely. They seem like aberrations, but he's missed 44 games in his first two seasons. He also has to become more reliable. His production was actually remarkable for being out so long to start the season. And that February run showed potential if not enough consistency. He needs a lot more strength and toughness as he gets moved to the outside too easily and doesn't finish inside strongly enough. He has a rare scoring ability and players his age a few years ago were still under dorm curfews. But they then were ready to take on 82 games. He also finished the season watching the last 11 games, which you hope was more preventative than concern since he's had injuries, though nothing major. He proved a welcome addition following the trade of Portis and Parker. Not so much losing Portis, but Porter filled a missing need at small forward with a cornucopia of skills. He shoots well, making almost 50 percent of his threes after the trade, and can make plays off the dribble as seemingly an ideal fit with the team's plans to employ multiple ball handler and playmakers in a varied offensive system. He's an unflappable veteran for a team that has lacked leadership. Otto Porter Jr. connects with Lauri Markkanen for the alley-oop. Another player with participation issues. He sat out the final eight games with a back problem, which made it 66 games missed over two seasons with the Bulls. Certainly, there were freak injuries, like his concussion last year. Dunn has been on the hot seat at point guard with the team's uncertainty at the position. He's seen himself more as a defender and facilitator at a time point guards are relied on to shoot and score. He seems to have suffered most from the coaching change as he gained confidence and a closing role under Fred Hoiberg. 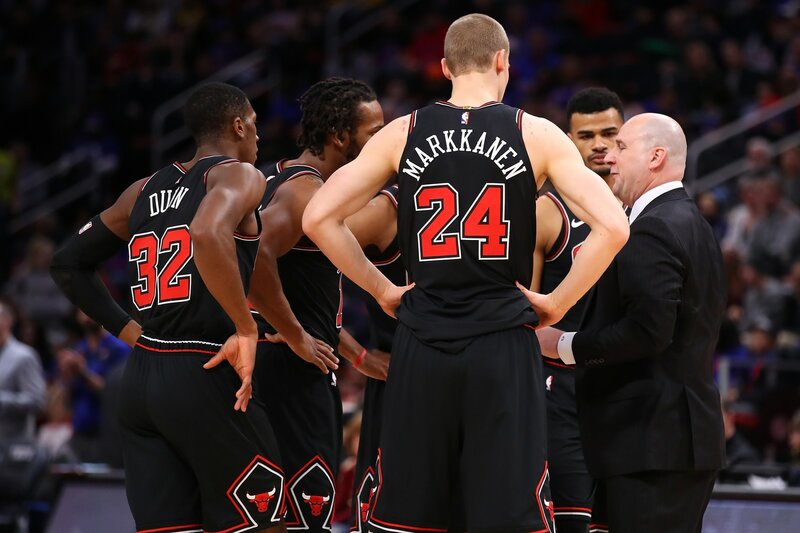 But by the time he returned from a knee injury this season, Jim Boylen had replaced Hoiberg and more often took the ball out of Dunn's hands as he seemed to struggle to find a fit. He promised to return next season with a reliable three-point shot, though whether he'll be the starting point guard remains a large question within the organization. The burly seven footer is a sentimental favorite around the team and in the community for his positive and upbeat nature and team-first mentality. His game has evolved with a clever drop step post move that enabled him to set personal career scoring highs for consecutive games with at least 17 points and several in the 20s. Though his return remains ambivalent. 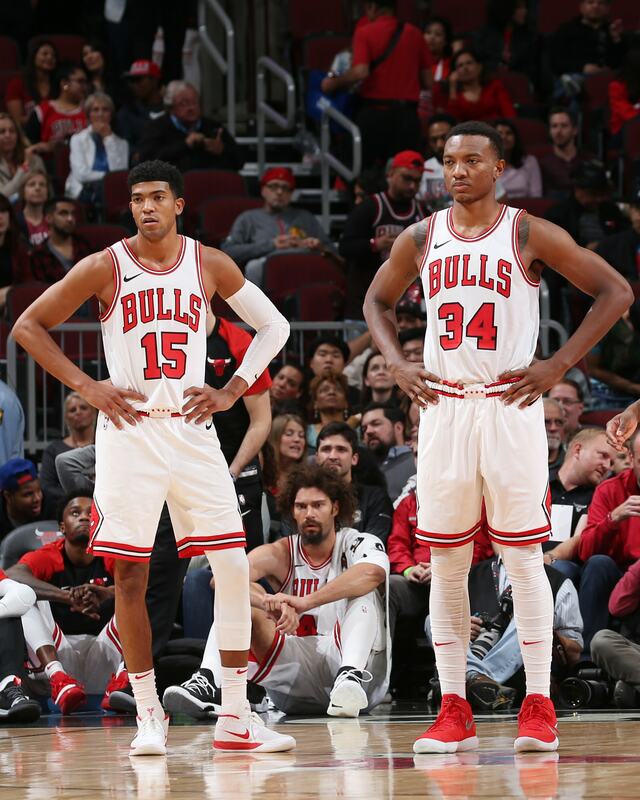 The Bulls need size with Wendell Carter Jr. slated to be starting center. But Lopez is an unusually poor rebounder and not a top pick and roll defender. He's 31 and the Bulls do need veterans. Though also he may not be ready to accept a reserve role yet and probably will explore free agency. The Bulls have a limited free agency payroll, so timing will be an issue as they explore the market and needs depending on the draft. The rookie No. 7 overall pick was having a strong season until a freak thumb injury in January ended his year. He had some big scoring games while mostly playing a supporting role and yet challenged top players, his block on a Russell Westbrook dunk attempt a highlight. His size at about 6-10 has been debated for NBA center, though he has a long reach. He should be able to fit with a versatile game that should evolve with a good shot. He's not a spectacular athlete, but strong-minded and physical and should fit the versatility the team seeks. The other 2018-19 first round rookie had a slow start with hesitant play. He seemed to begin growing more confident when he suffered a toe injury in January and was out the rest of the season. He's considerably behind a rookie like Carter and mostly has shown just flashes of his potential and moves at times which are reminiscent of former Bull Scottie Pippen. He has long strides and impressive athleticism in the open court, but still is unsure about his shot and playing in the half court. He had to start some at small forward, which is now Porter's position. So he will try to fit in as a reserve as the Bulls sort out their bench unit for next season. The reserve point guard worked his way impressively from undrafted to the G-league to the roster and it would seem a spot for next season. If only for everyone to see what playing every game looks like. He played 81 games and spent more time down on the floor than anyone by leading the team in charges taken. He improved his shooting to 37 percent on threes and probably needs to attempt more. He might not be the ideal second teamer, but he deserves a spot on the roster as a valuable player who can be relied upon and a relentless competitor. Denzel Valentine: Did Not Play. Ankle surgery. The reserve swingman couldn't get past his ankle problems and had surgery and missed the entire season. He had been showing an ability to make threes and pass the previous season. He's not very fast, which limits his potential to be a starter. But he could be a prime facilitator for the reserves the way the Bulls want to play. It's not a statistic that's probably recorded, but no one make more steals by getting back faster after making a turnover or poor play. He's unending hustle, but as a point guard doesn't shoot or pass well enough. Among the legion of undrafted and G-league players, after Arcidiacono he probably has the best chance for a roster spot. Though it might not be very high and he might be better off trying elsewhere. 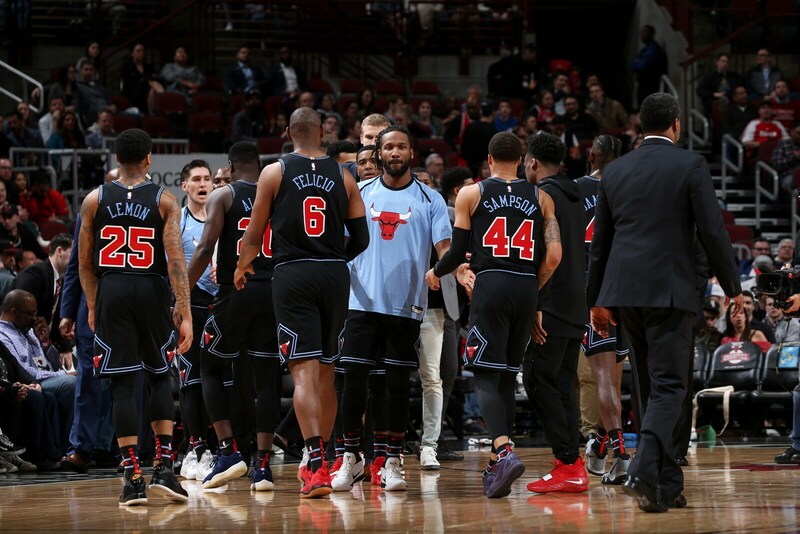 Depending on the return of Valentine and acquisitions, the Bulls will need more scoring off the bench than they showed. The Brazilian big man tries hard, but has a slow reaction time for the NBA. He has two years remaining on a four-year contract that is descending and pays $7.5 million in 2020-21. He'll probably remain with the team in an emergency backup big man role. He was acquired in the trade for Justin Holiday. He's a tough-minded player with the ability to make a quick three on occasion. He's a worthwhile reserve, but among the many whom the Bulls played at the end of the season they probably want to return with perhaps just one or two in order to upgrade the roster talent. The shooting guard appeared to fall between the cracks of the changing foundation last season. He shot reasonably well, almost 40 percent on threes, but he had a diminishing role at times and numerous DNPs. He is on an NBA minimum guarantee for next season. The Bulls acquired him on a salary dump from Oklahoma City as a look see, and they've probably seen enough. He's a high volume shooter who doesn't make that many and a free agent who likely will not return. He was one of the Bulls pair of two-way players from the G-league. He is a hardworking hustle player who doesn't shoot well enough and who probably will not be back with the team. The second of the two-way G-league players who showed some long range shooting ability as a big guard. But he never had much of a role and seems also unlikely to return. The Bradley product and young journeyman had some big late season scoring games with a unique ability to get to the rim off the dribble. He showed an impressive scoring component and shooting despite an unusually high arcing shot. He perhaps could battle Arcidiacono for a third team point guard spot if the Bulls were more inclined to seek an offensive player. The late G-league callup had been in training camp with the Bulls, but didn't play much. He developed good three-point range for a hustling big man and an ability to score slashing to the basket. He could be an intriguing prospect as a reserve big man.